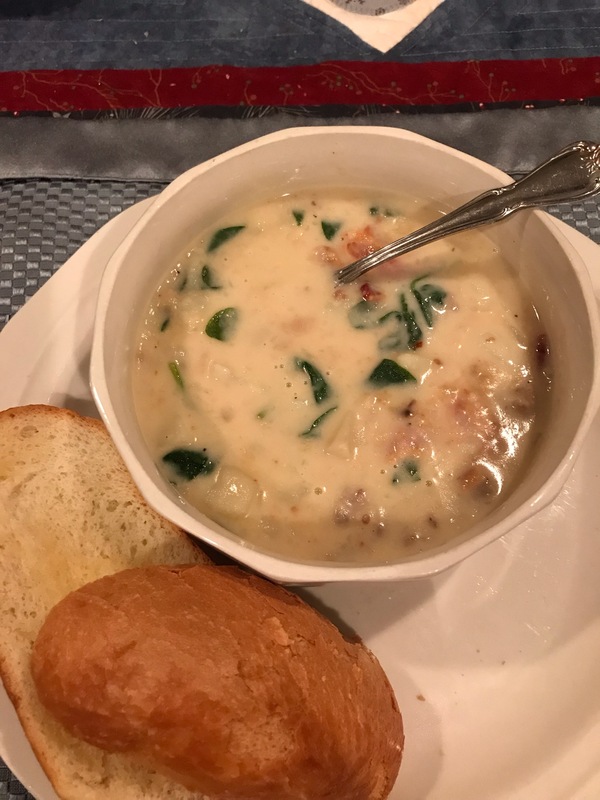 First Tuesday Recipes for January 2019!! I know the First Tuesday Recipes are appearing on the Second Tuesday this month, but with last Tuesday being New Year’s Day, I figured you might want a break. With that being said, Happy New Year! I’m looking forward to everything 2019 might bring and planning to share lots of good content with you. This is one of my niece’s favorites, though my sister makes it a bit differently than I do. Cook sausage and onion in a skillet until sausage is no longer pink and onion is translucent. Set aside. Cook bacon and set aside (I prefer to cook the bacon in the oven). Crumble when cool. Put chicken broth, potatoes, beans, garlic, and hot pepper flakes (if using) in a Dutch oven and bring to a boil. Reduce heat and simmer, uncovered, until potatoes are tender, about 12-14 minutes. Using an immersion blender, blend soup until about half of it is pureed. Leave about half of the potatoes and beans solid. If you don’t have an immersion blender, you can use a regular blender–just be careful because the soup is hot. Add sausage, onions, and crumbled bacon to soup; stir. Add heavy cream; stir. Bring mixture to a boil and let boil for one minute. Add spinach, swirl around for about a minute, and serve. My sister serves it with garlic bread and it’s delicious that way! Cook bacon until crisp; set aside to cool. Reserve 2 tbsp. bacon fat. When cool, crumble bacon. In a large skillet, cook eggs in bacon grease and season with salt and pepper. Set out the tortillas on a table or large counter space. Place appr. one scrambled egg on each tortilla. It helps to fill all the tortillas at the same time because if some have too little egg and some have too much, it’s easy to adjust. Top each egg with a bit of crumbled bacon. Top the bacon with a bit of shredded cheese and top the cheese with sliced scallions. Roll up each tortilla, tucking in the ends, and wrap each one lightly in a paper towel. Then wrap each one in a small sheet of tin foil. Place in freezer. When you’re ready to eat a burrito, remove the foil. Remove the paper towel, then wrap the paper towel around it again (this is just so the paper towel doesn’t stick to the burrito while it cooks). Place burrito in the microwave and cook for about a minute and 15 seconds (you may have to adjust this time, depending on your microwave). This is delicious with salsa, but it’s also perfect to just grab and go. It can be easily adjusted–if you like sausage or ham instead of bacon, use that. No meat? Fine! Veggies instead? Fine! Just make sure they’re cooked and patted dry before adding them to the burrito. Lots more cheese? Fine! Less cheese? Fine! No scallions? Whatever you want! Do not mix the layers in this dessert. Preheat oven to 350 degrees. Melt butter in a 13×9″ baking dish. Press graham cracker crumbs into melted butter. Sprinkle graham crackers with chocolate chips. If using, sprinkle the chocolate chips with butterscotch chips. Sprinkle the layer (or two) of chips with the coconut. Pour the condensed milk over the top of the coconut; sprinkle with pecans. Enjoy! Please remember that I always welcome recipes from readers, so let me know if you’ve got one you’d like to share!